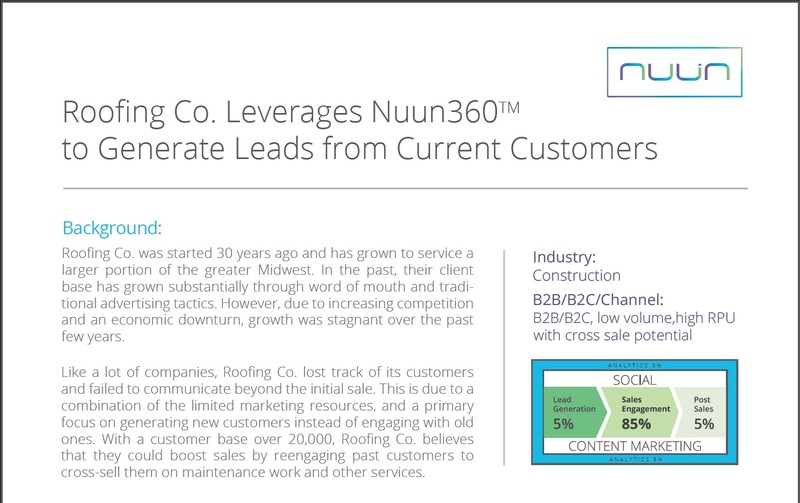 Roofing Co. plans to use Nuun360TM to not only engage previous customers, but to reach out to a new customer base through lead generation techniques and automating social media. The results that Roofing Co. can achieve using Nuun360TM are not possible with traditional ESPs and a basic CRM system. Integrating all of their marketing efforts into a single marketing automation platform allows them to have near one-on-one communication with their customers in a high-converting process. The end- to-end tracking ability allows Roofing Co. to see the ROI of each of their efforts, allowing them to effectively allocate resources to the highest performing. Contact us to schedule a live demo!